Poetry is an art and when you pen down your emotions, feelings and experience with words which can be related to the readers, you become an artist. Writers write in different genre and each has its own style and taste. 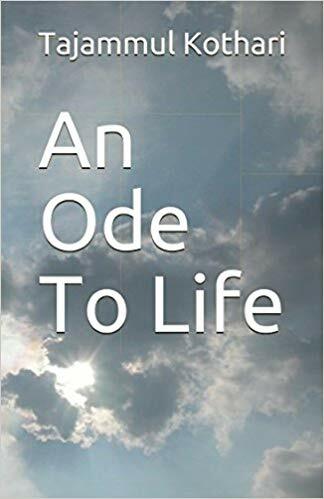 This blog post is about one of my blogger friend who gave me a chance to go through his debut book titled, “An Ode to Life” containing his collection of poems. My friend Tajammul Kothari is the author of this book and it takes me immense pleasure to write the review for his debut book. I would also like to express my apologies to him as I am writing this book review post after one half years of publication as I was quite involved with my studies and other aspects. Apologies for the same Tajammul. The writer is available at his blog titled Worldly Realization. Kindly visit his blog for his beautiful work. The sentence “You can’t murder love” is more than enough to say what love is. This is amazing and you will find many such kind of poems with beautiful stanzas in his book and I am sure you will love it. Poetry has its own taste and this book is really worth to read. I would like to congratulate him for getting his work published and also like to thank him for giving me an opportunity to go through his literary pieces and I hope he will continue to offer the readers with his beautiful work in future as well in the form of his writing.